Our coach left at 8am from Colonia to Montevideo, and took about 3hrs. Luckily there was wifi all the way there, so we were able to look up the famous sites and plan the things we wanted to see. As we arrived we could quickly see the bus station was quite far out of the city centre, so we had quite a walk to the main sites. Just outside of the bus station was a very large cross in front of an impressive church. We then followed the main road into town stopping along the way at various points of interest. The first of such was a replica of the statue of David outside the art museum. Next we passed a fountain were couples had attached locks much like the lovers bridge in Paris. Many looked quite old and I’m not sure how much longer the fountain would still be standing given the number of locks. We passed many architectural impressive buildings with beautiful iron work, and domes roofs in the style of many European buildings. After some lunch we continued walking further into town. We passed more statues and pretty water fountains. One depicting a battle with fallen horses was quite impressive. As we were passing our hotel we checked in and after some confusing Spanish about if we wanted single or a double bed, we were given a room with both! 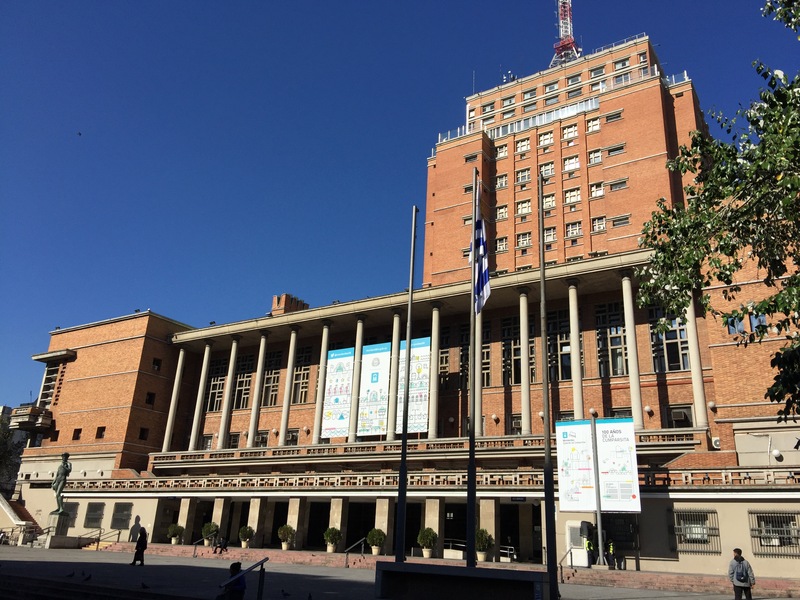 We continued our walk into town and to the Independence Square or Plaza Independencia. 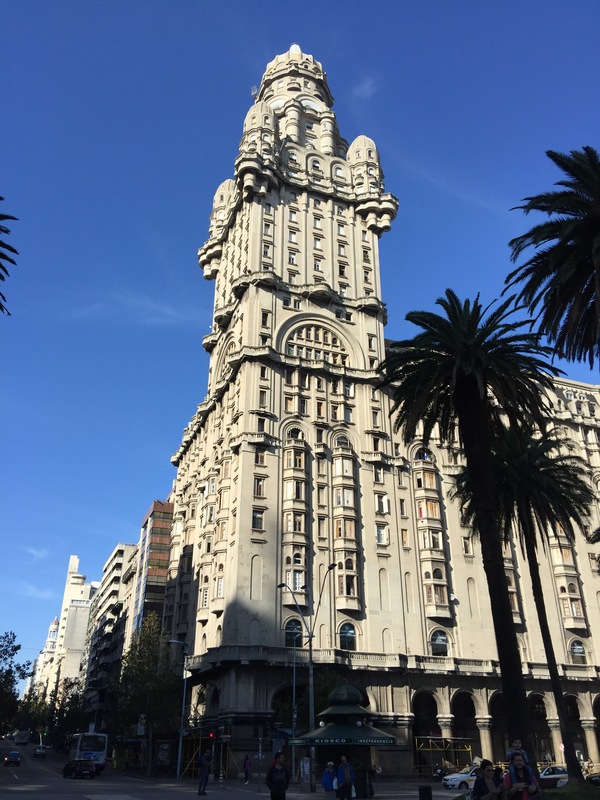 Here was the main famous building from Montevideo: Palicio Salvo, a tall building, with curved domes on its turrets and larger dome on the roof. Quite unusual looking and led to Mike to compare it to the rebel ships in Star Wars (the bubbly Mon Calamari ones). There was also a statue of Artigas in the centre of the square who is the father of Uruguayan independence. We walked through the old city gate on the edge of the square, which now acts as the gateway to the main shopping area. We walked down the street, exploring until we reached the metropolitan cathedral. From the pictures on google it looked pink, but in person was more light yellow: maybe repainted. Nevertheless it was pretty but hard to photograph because of trees and traffic. From here we walked down to the dock and esplanade area. Many old colonial buildings stood here but many in disrepair. There was one huge building which seemed to have a lighthouse on top (Centro Gastronomico) and lots of street graffiti everywhere. Along the esplanade we walked with the ocean hitting the high sea wall. Many fisherman stood with their lines bobbing in the surf and a peculiar red brick chimney stood alone in the waves. Perhaps once part of some factory that had long since crumbled. Next to the esplanade was a park where many homeless had made their home next to a striking church that stood by itself. Possibly abandoned as there were. I signs of life. Here we found a quite spot to fly the drone over the city. 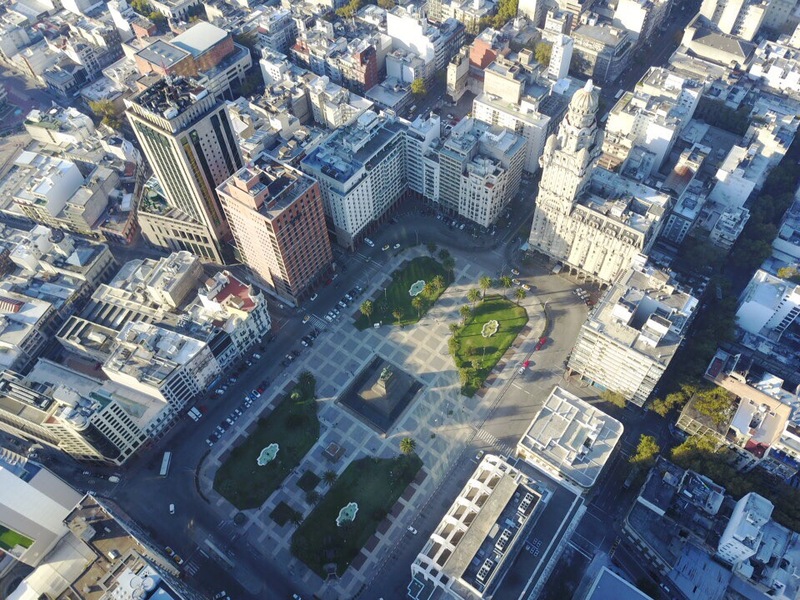 Mike enjoyed flying over the tall buildings and taking pictures of the Plaza de Republica. With the sun now having moved it was in a better place for some photos. We walked back to many of the sights we had visited earlier to get a better shot. After a lot of walking we went back to the hotel for a sleep and came out again in the evening. We expected some of the impressive buildings to be lit up but they weren’t. So we settled for finding somewhere for dinner. 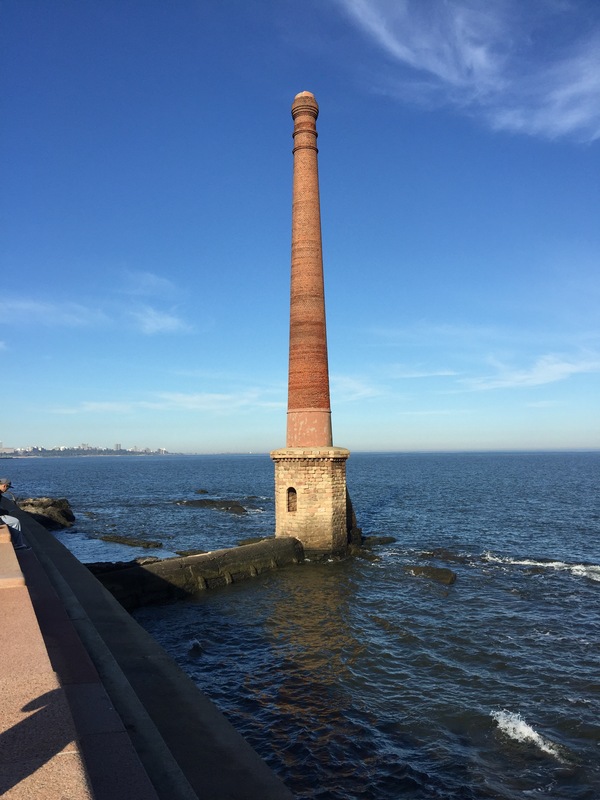 Montevideo didn’t disappoint and we enjoyed wandering the city looking at the architecture. Next stop was the beach area of Punta del Este our last stop in Uruguay.